“I think you are a Summer!”, “I love pale blue, but I’m a deep Autumn, so I can't wear it”, “Please help me: I’m a cool Summer and don’t know how to build my fall wardrobe”. Colour analysis and specifically the four-season typology has always been a prevalent topic here on INTO MIND, and a dedicated post has long been on my to-do list. Although I’m big on colour and all for creating a wardrobe around a defined colour palette, I have so far avoided the topic of colour analysis for one reason: I am not a huge fan of typologies that prescribe a type-based solution. I don't want to tell you exactly what to wear or what items to put in your wardrobe, I’d rather just give you a formula for coming up with your own solution. BUT... while moving to Berlin, I rediscovered a copy of Carole Jackson’s classic "Color me Beautiful", which came out in the 80s and was a huge hit at the time. I remember finding it in my mum’s book collection when I was about 14 and being super fascinated by it. I liked all the pretty colour palettes, sure. But more importantly, I loved how it emphasized the importance of figuring out what works for you and your life specifically, instead of following trends, and the idea of slowly building up a wardrobe around your individual style. All in all, I do believe colour analysis can be an enourmously helpful tool for curators, because it forces you to consider the role of colour in your wardrobe and points you towards a palette that suits your own complexion and away from trends. However, I think a colour profile should be used as a guide, rather than a set of rules. Relying on your colours 100% might stifle your own creativity and prevent you from fully exploring your individual aesthetic preferences. This week will be dedicated to colour, colour analysis, the 4 season colour theory and above all: tailoring your wardrobe to your own individual colour palette (whether it follows traditional colour theory or not). First up: Finding your colour type. "Color Me Beautiful" increased the number of types from 4 to 12 sometime in the 90s, which has improved the accuracy of the theory, but at the same time made it a littler trickier to find your own type. I'll do my best to explain the basics in this post, but feel free to message/email me for assistance. The next post will then be a complete guide to your colour palette, for every sub-type. Then, at the end of the week or the beginning of the next, I'll show you how to utilize what you have learned about your type to curate your wardrobe and tailor it to your individual colouring (plus: what to do if your colours don't match your preferences/ style concept). The seasons represent the four possible variations of these two variables: If your natural hair colour is lighter than medium brown, you would be typed as either a Spring or a Summer; if it’s darker you are a Winter or an Autumn. If your skin tone and hair have a warm undertone, or you are a natural red-head, you would be classed as either a Spring or an Autumn; if your skin has a blue-ish, cool undertone and your hair is more ashy and has no golden or red highlights, you are either a Summer or a Winter. Note: This is a very stripped-down summary of the whole process. The original Color Me Beautiful material provides a much more detailed explanation and also outlines various exceptions (e.g. in very rare cases a Winter type can have almost platinum blond hair). 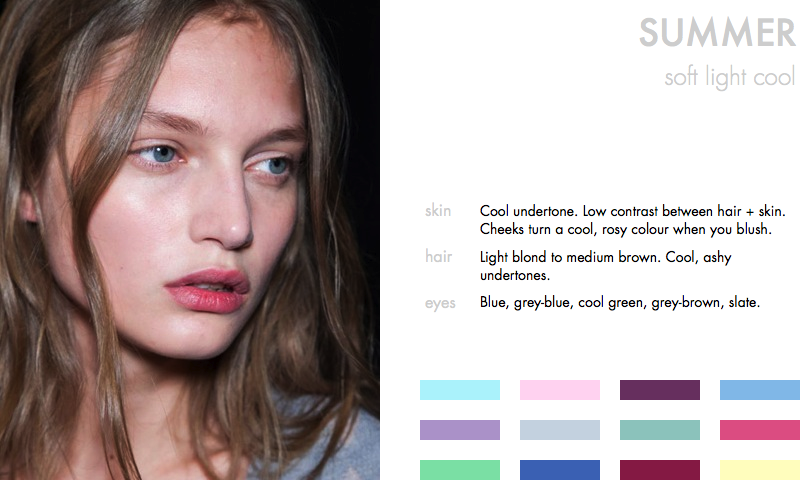 Below you'll find four quick profiles of the seasons and 12 typically suggested shades. 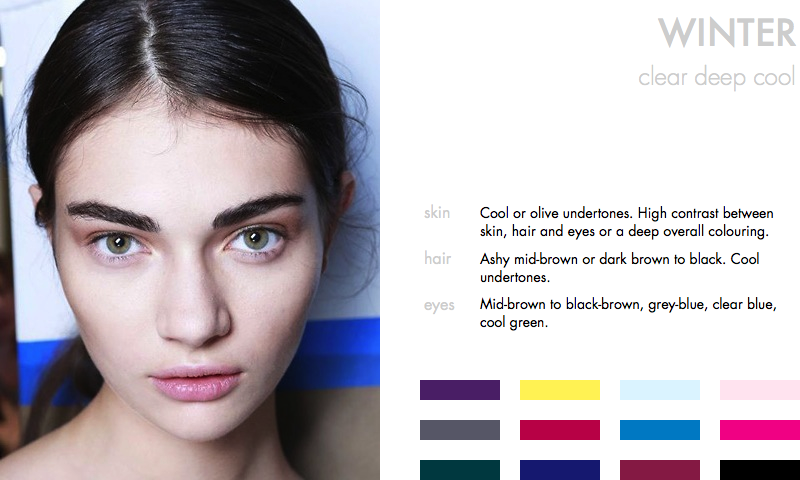 Go through each profile and compare their descriptions to your own colouring (natural hair colour and bare skin!). Ignore your favourite colours and your wardrobe. For now you are trying to get an accurate view of your colour type and the colours that suit you best, regardless of whether you like them or not (we'll deal with disparaties in the next posts). If you find it difficult to figure out your season, you might be a less pronounced or more neutral type, and will have better luck with the more refined 12-type system (more on that below). If you immediately recognized your own colouring in one of these four seasons: congrats! If not, don't worry. Unless your colouring clearly matches one of the two sides of each variable (i.e. is obviously light vs dark and warm vs cool), figuring out which type you are might require a little digging. Also: the closer you are to neutral in either of the variables, the less will your colour palette apply to you. If your neutral/warm colouring puts you in the Autumn category - but only just - you will suit different colours than someone who has deep, red hair and is immediately identifiable as an Autumn. For example, I have naturally light blonde hair, so I am definitely either a Summer or a Spring type. What’s my skin’s undertone? That questions is a little harder to answer. 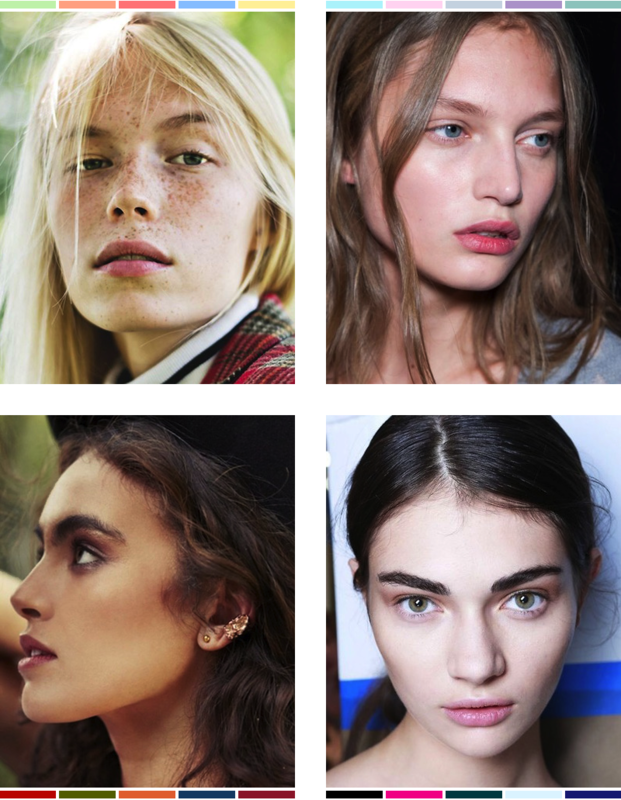 In general I would say I veer more towards the Spring side, because my skin and hair are not ashy, and when I blush my cheeks turn a peachy colour, rather than a bluey pink. Now...Carole Jackson says that all of us fit one colour season, and only one, but I have to disagree. Both variables lie on a clear continuum (light to dark and cool to warm). They are not two completely distinct groups, so treating the corresponding palettes as distinct makes little sense. The closer you are to neutral in either of the variables, the more likely it is that colours of the neighboring palette suit you just as well, and also that several of your own palette’s colours might not suit you. Deep: You are either a deep Autumn or a deep Winter. You have dark brown or black hair and deep brown, green or hazel eyes. You look amazing in the deep, vivid shades of your palette, e.g. deep terracotta (Autumn) or black (Winter). Warm: You are either a warm Spring or a warm Autumn. Your overall colouring has a distinctive warm undertone to it. Your hair is either golden blond to brown, or strawberry blond to deep auburn. Your eyes are green, topaz, hazel or light to medium brown. You best suit the mid-range colours in your palette that are neither too intense nor pale, e.g. a medium tomato red (Autumn) or a soft aquamarine (Spring). So, what type are you? Was it easy to figure out or did you veer between two types? Are you into the 4 season colour typology or do you find it confusing/restrictive/not helpful? 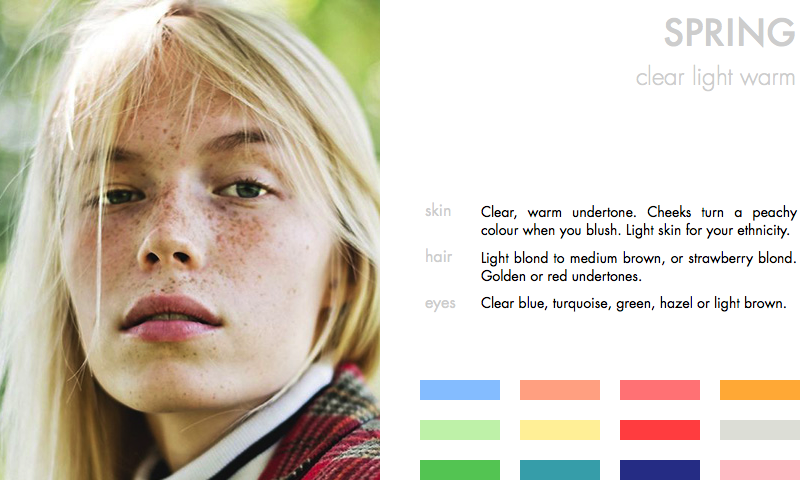 IMAGE SOURCES// Spring: Noora Lappi by Kevin Trinh via FashionEditorials.com. Summer: Alexander Wang S/S 2014 via thebeautymodel. Fall: Mr.Kate Days of Ore Lookbook shot by Kat Borchart. Winter - Indigitalimages.com, Derek Lam S/S 2014 via Vogue.it.